Well, it’s another very snowy day in Northern New York. I didn’t have to go into work, so I decided to do something special for breakfast, and searched my new Irish cook book. Unfortunately, our cupboards are a little bare… One recipe jumped out at me because of what little was needed and the seasonally appropriate ingredient – snow! I hadn’t ever cooked with snow before, but we’ve been getting so much that I decided to try it out. The top of the piles near my door were so fresh and clean that I wasn’t worried. After all, plenty of people make ice cream with snow… So why not give it a try? I never cooked with snow before… Photo by Grey Catsidhe, 2015. Mixing snow into batter is a bit problematic, though… It looks a lot like ice cream and doesn’t pour like typical pancake batter. Well… it doesn’t if you’re impatient like I was. I wanted to feed my family and this wasn’t something I planned for in advance. The recipe says you should let it sit and melt for several hours. I saved much of the batter for another attempt tomorrow, but I’m not very impressed with it at the moment. The excess moisture seemed to make the pancakes really difficult to cook. No matter what, they felt really doughy in the middle. I ended up putting them in the oven to finish cooking which helped. My husband said he liked how crispy they became on the outside after that. We both concluded that they were a similar consistency to Indian naan after that. 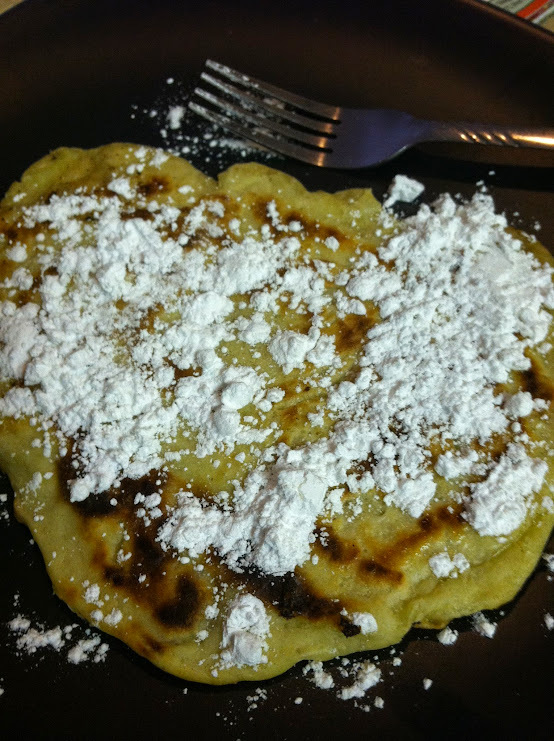 Powdered sugar seems necessary on a snow pancake. Photo by Grey Catsidhe, 2015. So while they didn’t turn out awful, they are more labor-intensive than regular pancakes. Supposedly, if you want to make them correctly, you’ll need to plan ahead and melt the snow in the batter for a few hours. I’m optimistic for tomorrow, but it is not something I can see myself doing often. The author of the cookbook, Darina Allen, even said it wasn’t a frequent dish, but that seemed to have more to do with the annual snowfall in Southern Ireland, where the recipe came from. As I prepared breakfast, I couldn’t help but reflect on how I was doing this because my cupboards were bare, and how that was a common occurrence for many of my Irish ancestors. Flipping through the cookbook reveals several recipes incorporating leftovers from previous meals. If An Cailleach blesses you with snow, why not not see how to use it?